Stjärnjul 2018 – 26th consecutive year! For the 26th consecutive year, Stjärnjul returns to create a wonderful, warm Christmassy feeling. Our broad repertoire mixes old songs with new ones, traditional carols with gospel, and contemporary music with classical hymns. Our Christmas concert is always built on joy, warmth and tradition. 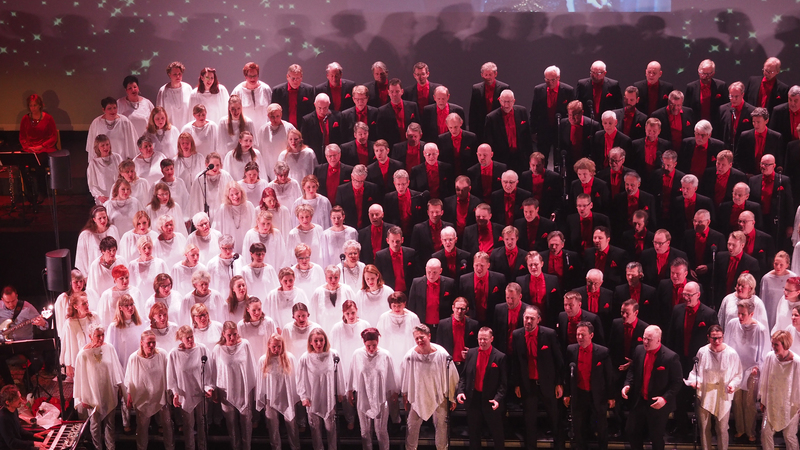 Centered around the mighty Stjärnjul Choir with 200 singers from The EntertainMen and Rönninge Show Chorus. As always it also includes an amazing orchestra under the direction of Grammy Award winner Mattias Bylund, and and a group of guest stars who give the show that something extra on top. This year Stjärnjul will have the pleasure of sharing the stage with artists like the creatively powerful filharmonic and TV personality artist Kalle Moraeus, the versatile musical theater singer Annika Herlitz, the energetic multi genre singer Kiralina Salandy, and the amazing Scandinavian tenor Kjetil Støa. These four, together with the rest of the ensemble, will give you a warm, cozy feeling which should carry you well into the coming year. Don't miss this unique opportunity! Book your tickets now at Ticketmaster. By tradition performed in Filadelfiakyrkan, Rörstrandsgatan 5, Stockholm. The show is about 2 hours long.